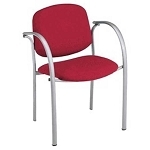 Product: OFM 404-VAM Vinyl Office Furniture 4 Pack Guest Reception Chairs. Free shipping for this 4 pack of Vinyl Reception Chairs when shipping to the 48 United States. If you find this model of Reception Chairs cheaper anywhere else online, let us know. We will try to match or beat their price. This contemporary guest chair has a waterfall seat and mushroom back design. 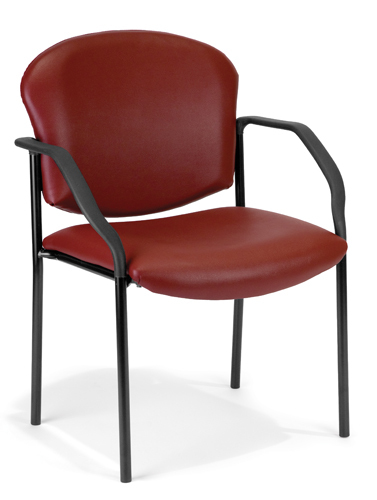 The frame is constructed of sturdy round steel and comes with arms and adjustable leg glides. The vinyl covering is easy to maintain in high-use environments. The anti-bacterial, anti microbial vinyl covering is great for keeping rooms germ-free! Competitive Edge Products, Inc. is an authorized retailer of OFM 404-VAM 4 Pack Vinyl Guest Reception Chairs. Fast Shipping: Orders for the OFM 404-VAM generally leave the warehouse within 1-2 business days. Dimensions: 30" x 21" x 13"